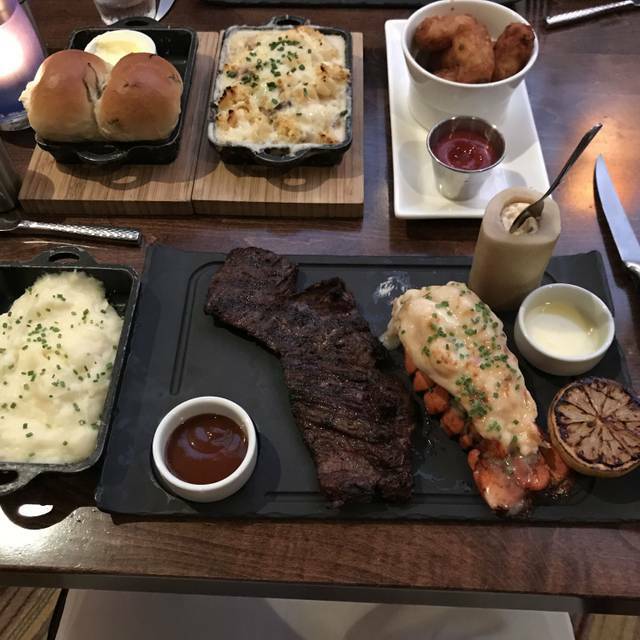 Chopps American Bar and Grill is a modern Chophouse serving inspired American cooking including a variety of succulent cuts of all natural beef, fresh local seafood, and regional dishes. Both emulating and redefining the traditional Chophouse, Chopps’ warm and unpretentious setting offers comfort and style. A prominently featured open kitchen gives guests a glimpse behind the scenes, as they enjoy a dining experience filled with great food, drinks, and smart casual service. Chopps is a popular gathering spot for hotel guests and locals alike that come for the bustling bar scene to enjoy live entertainment and a carefully crafted cocktail or glass of wine. Good concept. Good atmosphere. Surprisingly good food with great service. Service wasn’t great. Food was ok. I liked the setting but I don’t know that I’ll go back. Great meal later on a Sunday night. The bacon appetizer is a must. First visit, for Dine Out Week, and husband and I were pleasantly surprised at how great everything was. At first restaurant seems very small but it twists and turns and is actually quite large. Bar area was lively. We chose our meals from the Dine Out menu, but saw many items on their regular menu that looked interesting. There were three choices for the first course, I had the butternut squash soup and my husband the crispy polenta. Both were delicious, but I would highly recommend the crispy polenta. Second course offered four choices, I had the flat iron steak with mashed and asparagus and my husband had the cod, both very good, and I took home some of my steak and have enough for two lunches. Dessert course offered two choices, and I had the trio of sorbets and my husband the tiramisu. The only negative was that they ran out of the peach sorbet so I was given two portions of strawberry and one of the lemon. If I was told this, I would have changed my order to the tiramisu. Our server was knowledgable and pleasant. Service was timely. Definitely will return. Great food and great service. Highly recommend the restaurant. Good experience at Chopps American Bar and Grill at the Marriott Boston Burlington. Nice selection of food and drinks! Food was not worth the cost. They did not recognize my wife’s birthday even though I confirmed it with the hostess before we were seated. Maybe just a bad night for them. On positive side chef comped one meal because steak was under cooked and they did provide complimentary desserts. The dining area is more open space than we expected. We were thinking in would be a more intimate setting. The lighting could have been more subdued in this style of dining. Michael, our waiter was prompt on service, personable and was helpful on Dining selections. 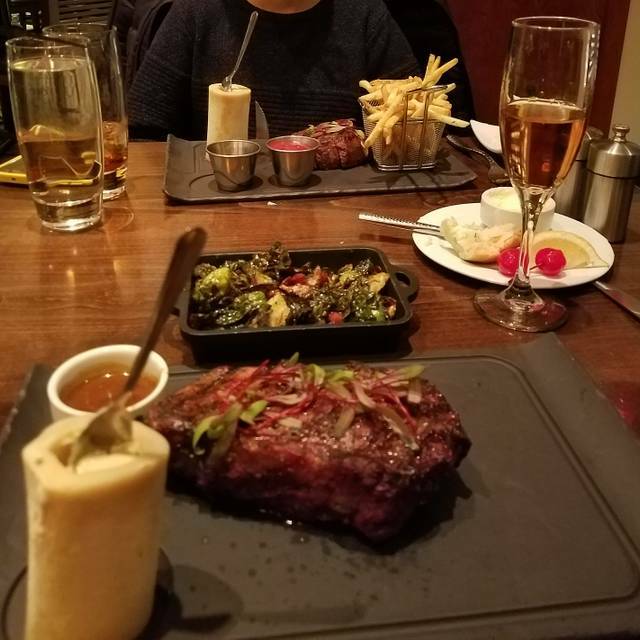 His suggestion of their bone in ribeye was spot on. My lady had fillet with lobster tail. Hers and my ribeye were done to perfection of medium. Both melted in our mouth they were so, tender. Both selections gave a choice of any sauce accompiment. My lady chose the house which she felt was a little on the bar B Que flavor it was good but, not what she was looking for, I stayed with he Horseradish, well made and just the right amount of bite. The suggested appetizer Crab cakes were of incredible quality filled with crab meat. They flaked apart showing that they were restaurant made by the chef. To finish off he strongly recommended the Blueberry bread pudding with ice cream which we shared. Again he was spot on. The assistants came by to clear the finished plates so, not to leave the table crowded. The water glasses were attended to perfectly, as I did not request a beverage. I was pleased to see that, after we finished our appetizer, the forks/knives were replaced with new utensils. The knives were replaced with steak knives. The attention to detail was impeccable. We would recommend dining here and to request Michael as he was conversive and truly enjoyed working WITH us in our selections. The food was average and over-priced for what you got, even though we ate the Dine Out Boston menu. The cocktails were small and also overpriced. It was nice that they had a live singer, who was pretty good, and made our evening more enjoyable. Our hostess was fantastic!! :):):) made a special evening even more so! The food was AMAZING! After dinner we then sat in front of the fireplace and enjoyed some cocktails. Noise level was low and we could have great conversation without shouting! Good meal, just nothing memorable. Considering the number of choices in Burlington at the same price point, and with similar menus, probably wouldn’t be at the top of the list to dine at again. Adult Sundae - brownie, ice cream, and bacon. Not bad! I loved my meal! I had the special- braised short rib mushroom ravioli. So delicious! Excellent service. My boyfriends steak was cooked wrong and they took it off the bill and gave free dessert. Great place, just noise level is really bad. Very very noisy and had to be moved due to rowdy children running around. Very good quality steaks and service was great. Delicious meal ! Everything was amazing! We both got the filet mignon with bearnarise sauce....cooked to perfection melt in your Mouth! He got the broiled lobster tail as well yum! The mashed potatoes very good, we also got a side of Mac & cheese, so so good. HAD to get desert even though we were full & so glad we did Blueberry Bread pudding to die for! He got the cheesecake. Fabulous Expresso Martini great experience! I can't wait to go back! Sat at the bar. Bartender excellent. Bar menu super. It was a really nice dinner in a very relaxing setting. Everyone liked their meal. The service was slow but friendly and didn’t detract too much from our experience. We’ll go back. Food and service was Amazing! Will go again! The short rib was excellent and skirt steak was great and talk about the seared scallops.....mmmmm. We had a 6 pm reservation. At 7:30 we still had not gotten out food. Period. The food was absolutely wonderful!! Honestly! It was one of the best meals I ever had!!! We had such a nice time, the food was very, very good and our server Gina was terrific ... very attentive without being overly so, and what a sweet personality! We highly recommend this place, it’s such a comfortable setting, if only they had a fireplace in the dining room but then again we’d never leave lol !! Went for Thanksgiving dinner. Rolls were cold. We had 5 people and they left 4 rolls. Had to ask for more. Turkey was salty, very skimpy on gravy even when we asked for more. Cornbread stuffing was dry. Not your traditional Thanksgiving dinner. Would not go again. Dinner was very good for a hotel restaurant. Chopps has a nice menu, could use more gluten free options. Presentation of food was very good and the wit staff was helpful and well informed. Among the best steaks we have ever had! Nice atmosphere and good for a special occasion. The experience was great. However, our party ordered three steaks and two of them were overcooked. That was disappointing. I found the food to be exceptionally good as well as creatively prepared. I had a creamed spinach side which was very flavorful and delicious. Others at the table had equally good tasting meals such as the short rib dish and of course one of your steaks. The service that Lisa provided was beyond special. She was attentive without a hint of intrusion. She was excellent! The night we were there was particularly quiet since it was Halloween - very few diners. So, very quiet which was wonderful for us. All in all, it was an excellent experience and we shall return. Food was fabulous. Consistently good. Been there several times and my filet is always perfectly cooked to my liking. Best appetizer: mussels w/chorizo! We'll be back again and again. I had a pleasant experience, would recommend it to anyone!